Weather events can have a significant impact on your business activities. Whether your staff work outside in the field or work from an office, Mother Nature can affect your business operations in many ways. From severe storms to floods to tornados, typhoons, hurricanes and cyclones, blizzards or heatwaves – no matter where in the world you are doing business, the weather can impede your work. Even if your work is mostly conducted from an office somewhere, it might be difficult or dangerous for your staff members to get to and from work in severe weather events, reducing your workforce and therefore your operations. It’s important that you have a reliable and robust method of communicating with your staff in the event of inclement weather. An excellent way to achieve this is by investing in DeskAlerts. 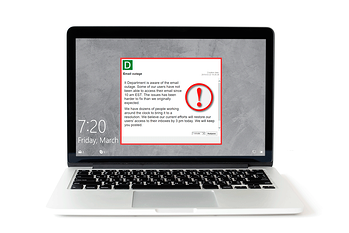 DeskAlerts is an innovative internal communications solution that sends messages via a pop-up window straight to your employees’ desktops. Unlike emails that can get missed, ignored or just don’t even get opened at all, DeskAlerts will appear on your employees’ screens, no matter what applications they are using at the time. The messages can’t be skipped or minimized – and you can send them out fast, which is essential when you’re dealing with a potential emergency situation. DeskAlerts enables you to create custom templates which you can populate with relevant information during an inclement weather event – saving even more time. You can send DeskAlerts notifications to the entire workforce or to select groups of employees. For example if you have a weather event that is going to affect staff who are based in one city, you can send messaging just to that geographic location. · Letting staff know as soon as you become aware of a forecast predicting a significant weather event. · Sometimes there may be several days notice that a significant weather event, for example a hurricane, is on its way. You can communicate steps that your staff need to take in the lead up to such a weather event, for example protecting computer equipment before they leave work before the storm hits. · If you operate across different geographic regions you can send specific information about the weather event to staff who are directly affected. You can inform the rest of your workforce that staff at the affected site may not be available until the weather event has passed. · Send messages throughout the weather event as necessary as the situation changes or progresses. · Once the event has passed, use Desk Alerts to send instructions about business continuity and recovery and the steps staff need to take to get up and running and back to business as usual again. · DeskAlerts can be used ongoing, when there is no imminent weather event, to send reminders about what to do in an inclement weather event and to link to your organization’s inclement weather policy.